Why is neutral wire needed? 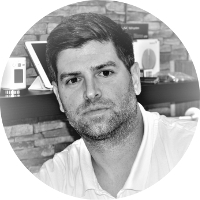 One of the most common questions we get is "Why are there no Z-Wave On/Off switches that work in a 2-wire system", or "Which relays can I use without neutral". At which point we always recommend using a dimmer, as these can work in a 2-wire system, and explain that there are no switches available that can be used without neutral. On the face of it, this doesn't make sense. A dimmer appears to be a more complex device than a switch, so you'd expect it to be the other way around. I thought this would make a good blog post to explain just why this is the case and delve a little into how these devices actually work. Note that for the majority of this article I'm not talking about simple mechanical switches, I'm referring to smart switches or relays that can be controlled wirelessly. When we talk about a 2-wire lighting system we mean that it doesn't have a neutral available at the switch (See APNT-23 for more information). 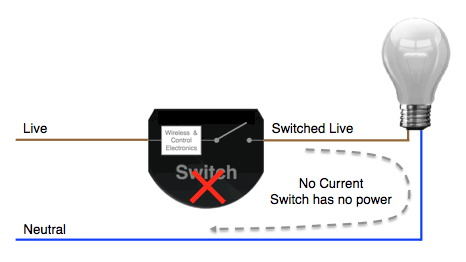 If you take a look at figure 1, you'll see that the light switch only has two wires - Live which is the permanent live to the switch and Switched Live that takes the Live supply to the light bulb. When the switch is closed, the Switched Live cable is live and powers the light bulb, this allows current to flow from Live through the light bulb and to Neutral - making the light bulb turn on. This is a complete electrical circuit. When the switch is open, no current can flow and the light bulb is off. This circuit should be familiar to most of us as it's a basic light circuit we probably all learnt about at school. 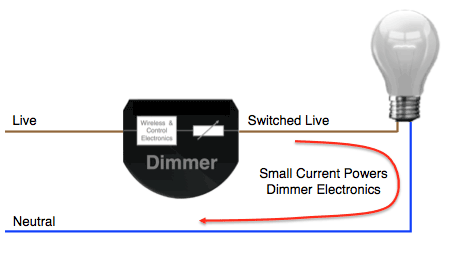 If we replace the mechanical switch with a dimmer, it will work perfectly fine in a 2-wire circuit (see figure 2). This is because dimmers work by reducing the current flowing through the circuit until it is so low that the bulb does not light. This means that even when you have reduced the dimmer down to 0% and the bulb is off, the actual circuit is not totally off. There is a tiny electrical current flowing from Live through the dimmer, through the bulb and to Neutral. This tiny current is enough to keep the dimmer and its wireless electronics powered and the device alive. This enables you to still control the dimmer wirelessly (or manually) whether the bulb is on or off - which is just what you want from a Smart device! 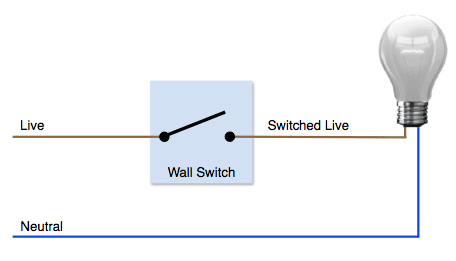 If we now add an electronic switch or relay (such as Z-Wave or LightwaveRF), you can see that the switches electronics are in the path of the switch. Then the switch is closed, current will flow through the circuit providing power to the electronics and lighting the bulb. But when the switch opens, the current stops, there is no current flowing through the circuit and there is no power for the switch or relay's electronics - it's dead and you will not be able to communicate with it. This is why there aren't any switches or relays that can work in a 2-way circuit without having a direct connection to neutral. 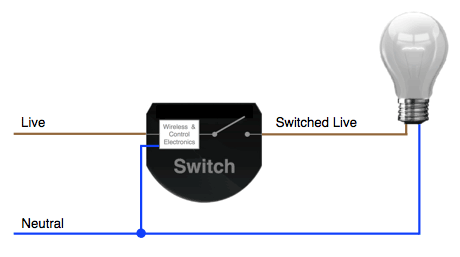 The only way you can use a relay or smart switch in a lighting circuit is to ensure that it can be wired directly to Live and Neutral as shown in figure 4. At the moment I can't see how a smart switch that doesn't need neutral can be produced - but I hope someone smarter than me can figure a way to do it as there are so many things we could use it for. je mozne pouzit smart vypinac v starej sieti TN-C, v ktorej je len faza+zelenozlty PEN vodic, pricom zelenozlty plni funkcie neutralneho vodica a ochraneho vodica sucasne. Bude vypinac fungovat spravne, ak pripojim zelenozlty na N svorku vypinaca? smart vypínač fungovať bude aj v TN-C sieti. Viac info a schému zapojenia napr. 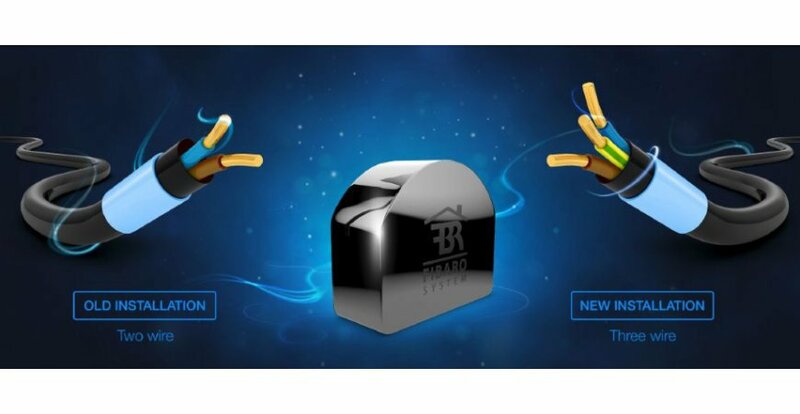 Fibaro Dimmer 2 (Stmievač) nájdete na fóre výrobcu Fibaro.